Finding a new “branch” of my Saulsbury family tree this week! This has been a very exciting week! James Edward Saulsbury was born in 1869 in Effingham Illinois. 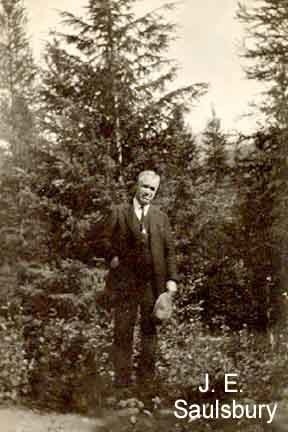 He was an older brother to my great-grandfather Charles William Saulsbury (1873-1953). My grandmother Lucille Morgan Saulsbury told me about a ‘relative’ who lived in Montana and when he died two wives came to the funeral, but she insisted that I not tell anyone. This Saulsbury family has been difficult to work on. William Saulsbury married Martha Green in Effingham IL in 1862. They had one son John Franklin born in 1864. Martha dies and William married Emily Jane Craig. Emily was the daughter of Preston Craig and Elizabeth June James. This second marriage in Effingham, IL was 24th Dec 1868. James Edward Saulsbury born March 1869. Mary Elizabeth Saulsbury born July 1871. Evaline Sue Saulsbury born 7 Sep 1876. Ida May Saulsbury born 1879. The family oral tradition is that William jumped into the river to save a child about 1879 and died. Fact – by the 1880 census Emily is working as a housekeeper for 4 bachelor brothers in Holland, Shelby Co., IL. Emily is listed as a widow and she only has the two youngest daughters living with her. Lula B. Conlisk born Feb 1888 in Center, Greeley Co., Nebraska. In the 1900 Census Emily & Hiram are farming in Hopewell, Hayes County Nebraska. In 1910 Emily and Hiram are in Egypt, Lincoln County Washington. This is a story of 4 adults and 8 children – 3 different families. This week I found that James E Saulsbury had married a third time. James married Blanche Clarice Hamilton in Chinook, Blaine County Montana, he was 61 years old and she was 31 years old. I knew that James had died in Hill Montana 1934, he was 65 years old. I went looking to see what had happened to Blanche – I found her working as a housekeeper in Sharmmeck Lake, Cascade County, Montana. What else did I find – Blanche had a 7 year old daughter (born 1933) named Billy Ann Saulsbury! She would be a second cousin to my mother! I found that Billy Ann Saulsbury married Eldon Miller 19 Aug 1951 in Shasta California. The best – I was able to call my mother and share this story with her. My mother didn’t have very many cousins and this was a great surprise! Now I hope I can find the rest of the story!